This is a classic royal icing recipe...use either meringue powder, or real egg whites (pasteurized for safety). Keep your mixer and utensils completely grease-free to achieve the correct consistency here. Meringue powder can be found where Wilton cake decorating supplies are sold. This recipe makes 3 cups of sugar cookie icing. 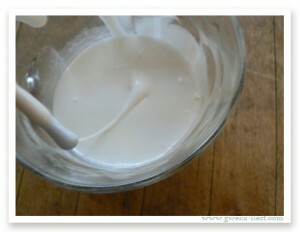 For stiffer icing, or if you're using a heavy duty stand mixer, use only 5 T of water. Add all ingredients to a mixer bowl. Beat until icing forms peaks: 7-10 minutes on low speed with a heavy duty mixer, or about 10-12 minutes at high speed with a hand held mixer. Divide as needed for thinning and coloring. 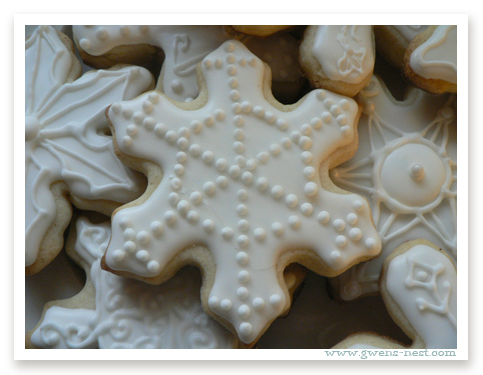 The un-thinned icing is perfect for piping details, lines, and dots. After base-coating with thinned icing, allow icing to "set" for 15-20 minutes, and then continue to add piped or painted layers. When you're done decorating, allow cookies to dry overnight before stacking. A flat, clear storage bin is a good "topper" over the cookies as they dry. This icing can be painted on, or poured over cookies.